Yea!! The sun is shining today and I have set up tea by my waterfall. How about joining me for some Lemon Lush dessert? For all of you that have been keeping my son, who has been in chronic pain for the past several years, in your thoughts and prayers, he is having the "trial" spinal transmitter implant procedure done this coming Friday. If it is a success, he will then have the final procedure a few days later. I so appreciate your concern for him and will keep you updated. Thank you so much! This Alpine Strawberry teacup by Roy Kirkham, made in England, is one of my very favorite ones. It's like a beautiful painting all around the cup and saucer, and the little bee is a sweet surprise. Lemon Lush is an old recipe that I've had for years. It's good in other flavors, like chocolate or pistachio, and it's always cool and refreshing. You can find a pistachio variation that I did here. 3. In a large bowl, mix pudding mix and milk until pudding is thickened. Spread over cream cheese layer. Top with additional Cool Whip and refrigerate several hours until firm. Three of my granddaughters spent the night this weekend, and we won't tell their parents about the saying on their shirts. They were fresh from their shower and then on to fun things.....shhhhh! I do love your strawberry teacup Kitty and although I've pinned your recipe from before, haven't made it yet. We don't have those cookies here, can you suggest a similar product or describe what they're like? Your granddaughters are sweet, and we have the same motto here! I will keep your son and his caring family in my prayers for this week. This looks gorgeous Kitty! I have copied the recipe and cannot wait to try this! It's such a happy little setting! Thank you! Love your adorable cup and saucer...and, OOO, that Lemon Lush is so calling my name. I've pinned it and will make it this coming weekend. Hi Kitty, you tea and dessert look and sound so yummy. I hope you have a nice Monday. What a cute bouquet of grandgirlies! Can't help but wonder what happened at Nana's. I am sorry that your son has been living with chronic pain and will pray that the procedure is the first step to pain-free living. Had to snag the recipe...it just sounds so good! Hi Kitty. We will be praying for your son...that it's a success and relief! What a great photo of the grands! I love Roy Kirkham...he does such cheerful and colorfuldesigns. The dessert looks wonderful! I DO love lemon! Thanks for linking to Tuesday Cuppa Tea! I'm so glad to hear about your son, Kitty. I do pray for him as you know and I will be waiting to hear how he gets along. God bless him! Love your pretty strawberry cup and your lemon lush looks a lot like my striped delight dessert. Your tea looks charming set up in front of your fountain. Would love to join you. Thank you for coming to tea with me and have a wonderful day. Kitty, I am praying the spinal trasmitter will help your son...there can't possibly be anything worse than living with chronic pain. Your granddaughters are adorable...cute shirts. Kitty, your lemony interlude by the waterfall looks so peaceful--I'm glad the sun finally came out in your neck of the woods. We're getting rain and thunder today, and it upset Z so much, I made him a little wolf den out of tartan blankets. Your grands are adorable, and I love their t-shirts. My DH has chronic pain in his feet, due to neuropathy, along with numerous other problems, and it's heart-wrenching to see it happen to someone you love. I will keep you and your son in my prayers. Such a fresh and pretty tea time. Lemon Lush sounds like something my mother used to make. It's refreshing on a summer day. I'll be thinking of your son as he works through these medical procedures and hope it all turns out well. Cute granddaughters. Aw, I'm guessing the sleepover shenanigans included lots of munchies:@) Sounds like a fun dessert and I see a new (to me anyway) strawberry cream pudding at Walmart... Wishing Mike all the best! Sending positive prayers your way for your son. Your granddaughters' shirts are too cute and of course so are they. I bet they just love staying at your house of sleepovers. Your first photo by the waterfall puts me in a summer mood. I'm looking forward to a lot of outdoor dining this summer. I'm so grateful for all of the wonderful recipes you post. It motivates me to bake more. 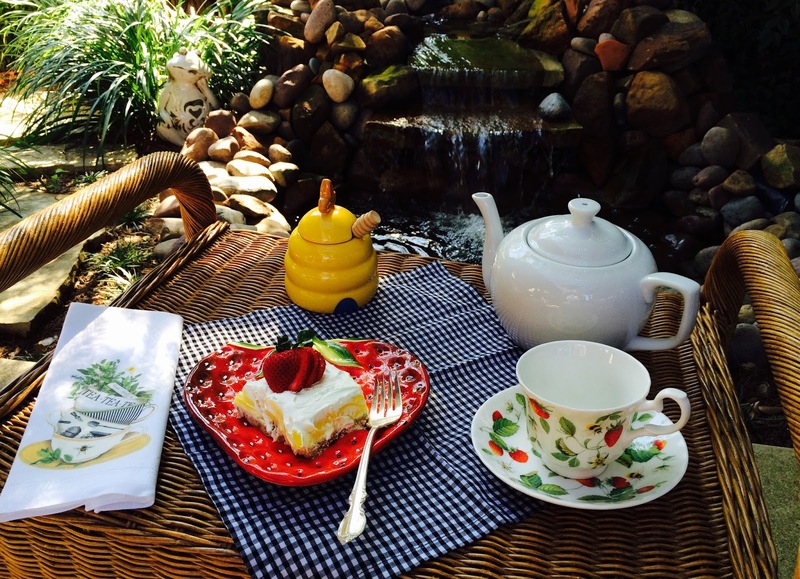 Very nice outdoor tea setting, Kitty! Your granddaughters' matching tees made me smile. I'll remember your son in my prayers. Prayers for your son. Love the tea cup. You have a great selection. .
ok those T shirts are SO AWESOME!!! I love the bright and cheerful tea you offer this week, how cute! Those cups w/ the yellow and strawberries are so sweet. the dessert looks so good too - I love lemon. What a lovely place to have tea and dessert, Kitty. Your teacup is beautiful and the lemon lush fantastic. I have made it before too, and I love it! Prayers for your son to get pain relief. Hello Kitty! You had me at Lorna Doones! Have not had one in years! Your grand daughters are so sweet, love their tee shirts. Keeping Mike in my prayers. Sending healing thoughts for your son. I hope this gives him pain relief. Pretty setting, Kitty. It's been sunny here as well. Nice! The lemon lush looks delicious, but those three little girls steal the show. What adorable grandkidlets!! How sweet they look & how lucky you are, too, to get to enjoy them. I can't wait to make this lemon lush...thanks so much for sharing it, as you know how I adore anything lemon! LOVE your pretty cup & saucer, too. So pretty. I will hold your son close in prayer, hoping this trial test is hugely successful. Well....your tea cup and lemon lush look beautiful, but they pale in comparison to your sweet granddaughters. It's been a while since I made Lemon Lush. It's easy to forget some of those old great recipes. Definitely will make it again. Praying for your son, too. I hope all goes well. Your grandkids are adorable! That cup and saucer is just so cute and dainty! Praying for your son right now! Oh, those granddaughters are so precious Kitty! You are blessed! (and so are they) I love anything lemon, those look delicious, and how nice you get to sit outside, with the cute little bee to keep you company. What darling girls and lovely t-shirts! Loved the dessert and sweet table setting too. So glad you shared. Oh Kitty, what cutie pies you have there! 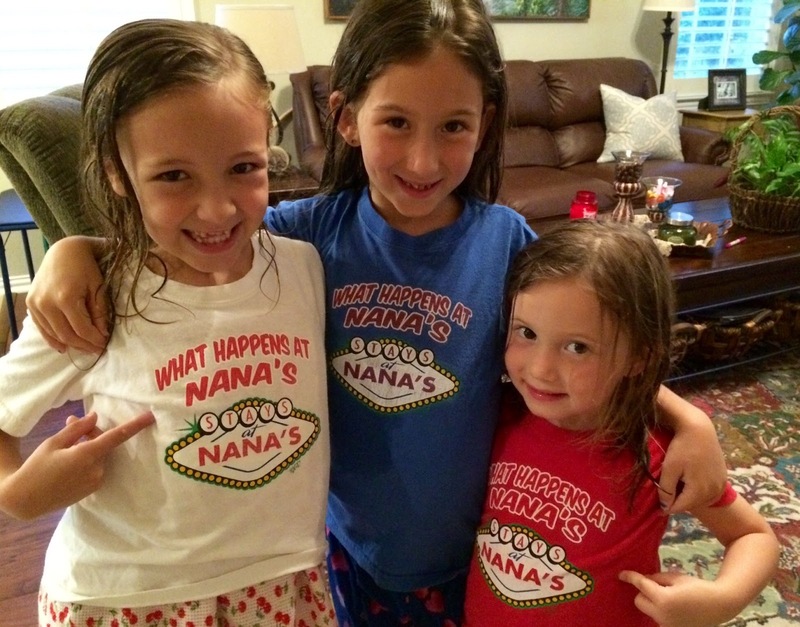 What darling granddaughters and their shirts are adorable!!! Nana's always have a special place, right? Lemon Lush is a new recipe to me, I'll be trying our old recipe! Oh my, what three little cutie pies! Don't they just have the sweetest smiles! :) Love the shirts! Your lemon lush sounds delicious and looks so sweet and refreshing - what a perfect treat for a hot summer day. Thank you, sweet friend, for sharing with Roses of Inspiration. Your dear son will be in my prayers..... Love to you! Kitty, it seems we both had strawberries on our minds this week! 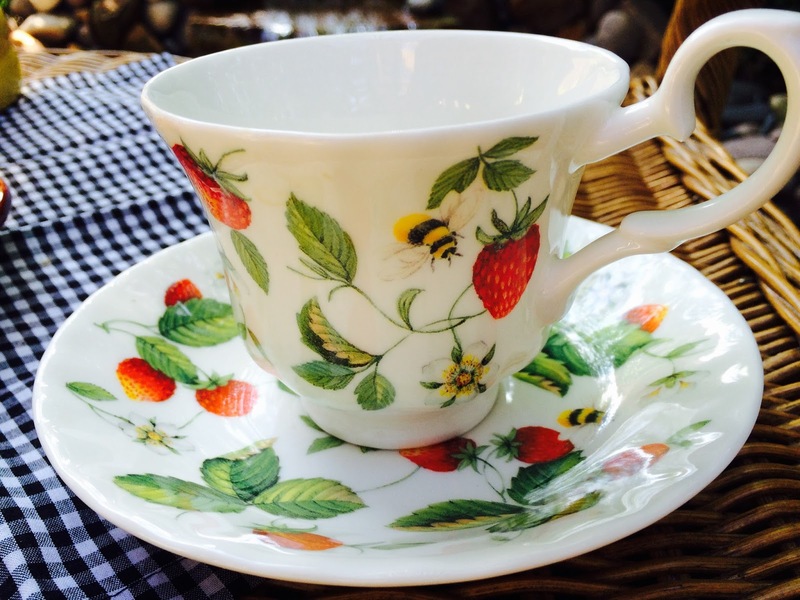 I adore that cup and saucer and the wonderful strawberry plate. The lemon lush looks yummy and I imagine that it would be wonderful using any flavor. The girls look like they are ready for so fun and Nanas (I am one, also!) can usually think of some! Love, love those shirts. Many prayers will be said for your son. Chronic pain is a terrible thing and I hope that he gets relief from this treatment. Aren't you super Grandma! What fun to have a girls sleepover, and I know there is always something wonderful to snack on in your kitchen KItty! The lemon dessert looks oh so tempting! I can't decide if I like the looks of the lemon lush more or your beautiful cup and saucer. That's one I would snap up in a hurry -- so pretty, Kitty! Your recipe looks wonderful too -- thanks so much for sharing. I hope you have a great weekend! Kitty, what a lovely dessert and so easy. I can't wait to see what you make with your Nutter Butters. Your grands are darling and I love their t-shirt saying. Kitty, I pray that your son does get relief from his pain! 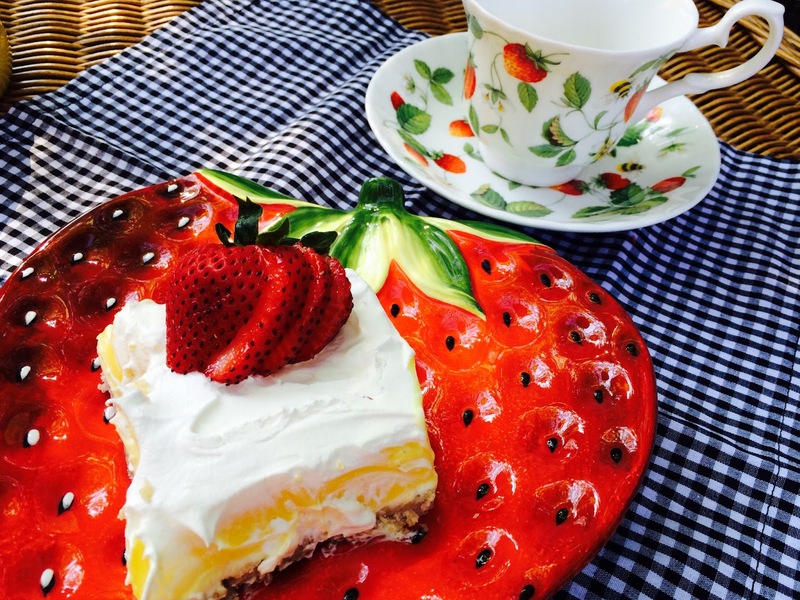 Your strawberry teacup and plate is so sweet and the dessert sounds yummy! Thanks for sharing with SYC. Beyond adorable grandies - my oh my you must have been in heaven for their visit! I had my youngest niece yesterday and today - so wonderful. We cooked and baked and played - of course I never thought to take pictures. Oh well. I seldom do it seems. As for your pretty tea time and that amazing recipe - lovely and I sooooo copied the recipe. I am going to try it very soon. Hi Kitty! Will be sending prayers for your son. Also , this post is my pick of the week for SYC at Jann's. Can't wait to try this recipe and I LOVE the strawberry cup.